A few years ago we moved from Nagios to Zabbix for our server monitoring needs. I wasn’t a big fan of Nagios, finding it a pain to manage with its myriad configuration files. It’s probably gotten better since I last toyed with it but since we moved to Zabbix I haven’t had much reason to look at Nagios again. I also try to use SNMP monitoring for everything. SNMP is widely supported – all sorts of hardware has SNMP support, and with the net-snmp package you can pretty easily create your own SNMP-monitorable stuff on Linux. Since almost all of our stuff runs on Linux this has worked out pretty well, but our Exchange server is probably going to be running on Windows for the foreseeable future. Windows has SNMP support, it’s just not on by default. However, even when it’s enabled it doesn’t have the simple “dskPercent” monitoring I’ve come to know and love with net-snmp on Linux, which simply tells you how full a given disk is as a percent. 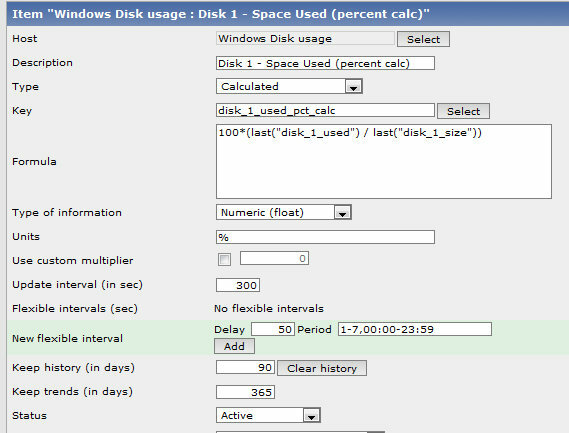 This makes it easy to set alerts when a disk reaches 80% full. I thought initially that the hrStorageUsed and hrStorageSize values were being reported in bytes, but according to this MSDN article, the units are reported in “allocation units,” which I assume are being reported under hrStorageAllocationUnits, so you just need to multiply the values by the allocation units. 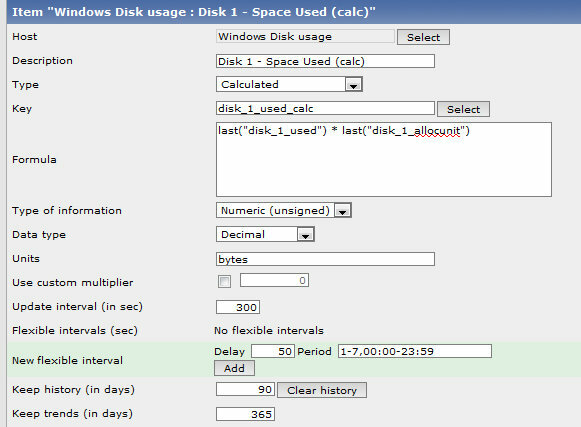 I created a template in Zabbix which monitors these data for disks 1-5 and then applied it to all Windows servers; now I just need to apply some alert triggers and mission accomplished. How about sharing the Templates? Hmm… I’ll take a look and see if I can. Never occurred to me. There you go, added at the bottom. Thanks, exactly what I wanted to do – monitoring Windows Storage without Zabbix-Agent. Hmm, I tested the template – but I got no output from SNMP. Also snmpwalk isn’t showing the Storage-Output. 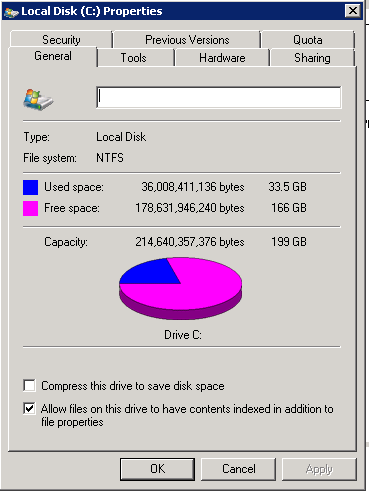 On the Windows box I enabled everything for SNMP, even physikal, but there is nothing for storage. Is this an issue of Windows? Or an issue from my Linux box with Zabbix? Maybe you need to allow SNMP traffic through Windows firewall (UDP port 161/162)? Solved. My Ubuntu wasn’t able to resolve the SNMP names, I changed the template to use IDs und now it’s working. Maybe MIB missing on my linux box? Maybe the MIB isn’t being loaded by Zabbix? I feel like maybe Zabbix looks in a particular dir for the mib, or maybe you can specify it at compile time… been a long time since I’ve done that though. Thanks a lot, you are save my time!!!! Exactly what I wanted!